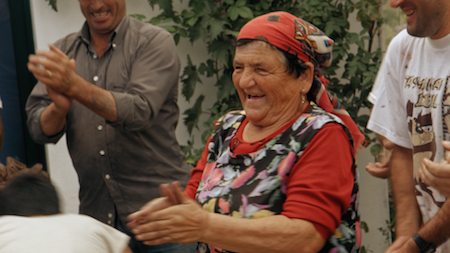 All three of these documentary films display the many difficulties to be found in growing grapes and making wine, no matter what kind. But for me, these Portuguese vines, many of them so old, yet still so remarkably fine, present the most challenging difficulties of them all... simply because of where they are. Filmmaker David Kennard sits back and gestures with genuine expansiveness. "It's extraordinarily hard not to like the people of Porto." You see what he means when you watch his new film A Year in Port. 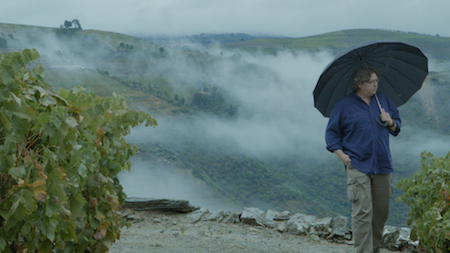 The final piece in a trio of films Kennard has made (the others are A Year in Burgundy and A Year in Champagne) this one takes us to Porto itself, a northwestern Portuguese city where the major operations of the port wine industry are located, and to the upriver Douro Valley. This is a wild place, through which runs the deep Douro River, of terraced hill- and cliff-side vineyards small and large, placed intricately along the banks of the river, and throughout the rugged hills that rise up from both sides of it. All three of these documentary films display the many difficulties to be found in growing grapes and making wine, no matter what kind. But for me, these Portuguese vines, many of them so old, yet still so remarkably fine, present the most challenging difficulties of them all...simply because of where they are. Photo courtesy of InCA Productions. Use with permission. A bit of history...Wines have been made in Portugal since at least the 12th century. This film tells of the very long diplomatic liason between the United Kingdom and Portugal. It has lasted unbroken for 600 years and constitutes the oldest such ongoing relationship in the world. The principal beneficiary throughout has been the thriving mercantile trade between the two countries. The British began importing port more than three hundred years ago, and that business proved so successful that a number of British vintner-merchants established their own manufacturing facilities in Porto. Thus, port wines often are notable for the distinctly un-Portuguese names attached to the companies that make them: Taylor, Cockburn, Symington, Croft, etc. Other European families also became involved, most notably for the purposes of this film, the Niepoorts of Holland, who founded their port business in 1842. Now, a number of the most important companies are still run by families from other countries, the current members of which can be even 7th or 8th generation Portuguese residents with double citizenship, speaking both Portuguese and their own native family languages fluently. To this day, a good deal of nostalgia-fueled British culture defines many of the Porto operations. In the film we are brought into meetings with members of a few families, in which the history and now the future of the port industry is discussed. We sit down to meals that look like they could have been staged for an ongoing BBC series about aristocratic 19th century England. We even attend a proper cricket match in Porto. There is significant affectionate humor in these scenes, but nothing obscures the fact that port is serious business to these people and to the country of Portugal, a distinctly international business the nuanced maintenance of which is never far from discussion. Port is wine that has been augmented during its fermentation with specific quantities of cognac. The addition of the cognac brings an immediate halt to the fermentation, so that the vintner can be certain of the precise level of alcohol that exists and the subsequent integrity of the wine's flavor. Also, the cognac strengthens the wine, as has been understood since the times when the long voyage by sail to England could damage the vintage and render it undrinkable. The film takes us through a year's production of port, and features remarkable specific aspects of this wine's making. Photo courtesy of InCA Productions. Used with permission. 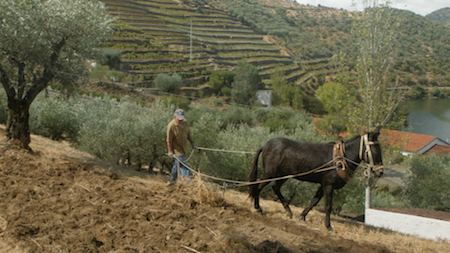 The very Douro region is a formidable difficulty in its own right, a rugged, even primitive-seeming landscape the farming of which is exceedingly arduous. Almost everything must be done by hand here. Then there is the "treading", which is done by foot. This is the practice of squeezing the juice from the grapes by many people walking on them bare-footed in large stone tanks. The film describes illustrations found on the walls of Pompeii, destroyed by the Mount Vesuvius eruption of AD 79, of groups of workers treading grapes. The production of fine port is one of the very last winemaking processes that still requires such a practice. In a distinctive, even heart-possessing, sequence in the film, we see how the same workers who pick the grapes in the Douro vineyards also tread them...mere hours after their having harvested the grapes. And there is the singular influence of extremely small amounts of well-aged port from ancient vines, some of them more than one hundred years old. These vines dot the Douro hillsides in numerous tiny plots that have been owned by individual families of local farmers, families that in some cases have been here for centuries. The process of adding even just a few drops from one of these old vintages to samples of the new vintage, simply to bring distinction, authority, intensity or complex depth to that new vintage, is shown and discussed in the film by various port winemakers. For anyone who cares about the combination of mind, knowledge, art and basic "feel" that is required to formulate something of pristine quality, this sequence in the film is not to be missed. Dirk Niepoort. Photo courtesy of InCA Productions. Used with permission. One last essential feature of port making is described by Dirk Niepoort, until recently the 5th generation head of the Niepoort operations in Portugal. Making quality wine of any sort requires patience...sometimes many decades of patience. Niepoort worries that, in the era in which we live, moving slowly is not considered an option. Instant connectivity, computerization, the cloud...all of it demands immediacy. In an offering of advice toward the end of David Kennard's stellar film, Niepoort says, "The times now are very fast. What I'm trying to teach my children is, please slow down...and think. Take your time. We have to give port time." Terence Clarke's latest novel is The Notorious Dream of Jesús Lázaro.